It might be hard to believe that summer is just around the corner. Beat the heat and give your jewelry collection a fresh update. Summer calls for fun under the sun so this means that jewelry trends are as spunky and lively as they can be. If you’re at loss for new ways to style your wardrobe this season, here’s our take on how to incorporate summer into your jewelry. Animal Prints. It’s definitely no secret that the skin pattern of cheetahs, zebras, tigers, and even butterflies, leopards, and snakes can amplify even the most basic wardrobe. Animal prints can transform an outfit and can add a bold and daring feel. When the styling is done tastefully, animal-print jewelry can even make an outfit look classic. This hot season, it’s all about celebrating the different prints of the animal kingdom. Layering Techniques. Have you accumulated a set of necklaces over the past years? It’s now time to take them out as the summertime is all about layering different pieces. Think of a series of chains with pendants on them for a California beach babe jewelry effect. If you’re into very long necklaces, wrap them around your neck thrice to produce a choker layer. If you want to go all out, combine vibrant beads, tassels, and fringe. Mix N’ Match. 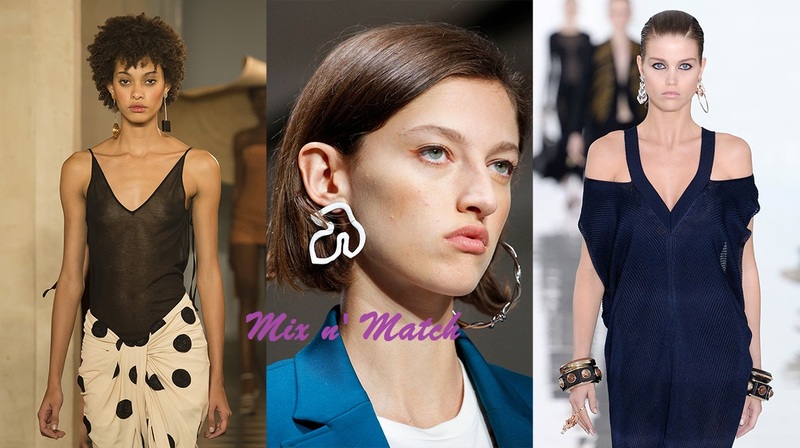 Have you ever been a fan of mismatched earrings? Break the rules of jewelry and work on your creativity! When mixing and matching, go for a bold earring on one ear and a sweet yet simple stud on the other one. If you want an even bolder contrast, opt for a thin dangle or a thick hoop. Don’t be afraid to experiment! Think about less matching and more self-expression! Thick Hoops. The new earring trends are quirky and fun, but hoops will always be in style. This summer, go thicker than usual with your hoops and don’t be afraid to flaunt them. Thick hoops are great for complementing an outfit and can also be paired beautifully with a t-shirt and jeans or a flowy maxi dress. Tropical Mood. What is summer without a tropical feel? Let yourself enjoy the natural shapes and the vibrant colors of the tropical season. Summer calls for jewelry inspired by flowers, fruits, and leaves of tropical regions. These exotic shapes will absolutely prompt you to plan and book your next getaway! Restyled Baroque. Remember the pearls of long ago that your granny used to wear during Sunday lunch? They’re back and updated with a unique twist. Baroque pearls are more contemporary and come in a variety of unique shapes and sizes. If you and your friends are the type to lounge around the pool on hot summer days, the baroque pearl is just the right jewelry that will give you a glam-up poolside look. Take your favorite summer outfits and bring them to a whole new level by accessorizing using the jewelry trends listed above. Summer jewelry trends are surely a feast for the eyes and ears. So this summertime, let your style shine and glow like the sun!